2 to 4 Copies: $28 each. 15% off. 5 to 9 Copies: $25 each. 25% 0ff. 10 to 19 Copies: $22 each. 33% off. 20 or More Copies: $20 each. 40% off. Book description: Imagine sitting in a room with the greatest football coaches in modern history. The topic: Leadership. This book is your own personal clinic with the unprecedented chance to pick the brains of the living legends on how to run a championship level program. View List of All 66 Chapters Here. Part 1 is an Interview Q & A with coaching legends like Jimmy Johnson, Urban Meyer and Lou Holtz. Part 2 is How to Run Great Practices. Part 3 are Athlete and Team Success Strategies. All 66 concise chapters give you action steps to get your team more W’s. Get the absolute best thinking on building a successful program from a diverse panel of coaching legends who share invaluable lessons on what it takes to compete at the highest level. The motivational ‘go to’ statement Bill Parcells used to turn around a player with an attitude problem…page 19. What Jimmy Johnson said at Super Bowl half-time to plant seeds of success that would become reality minutes later…page 28. 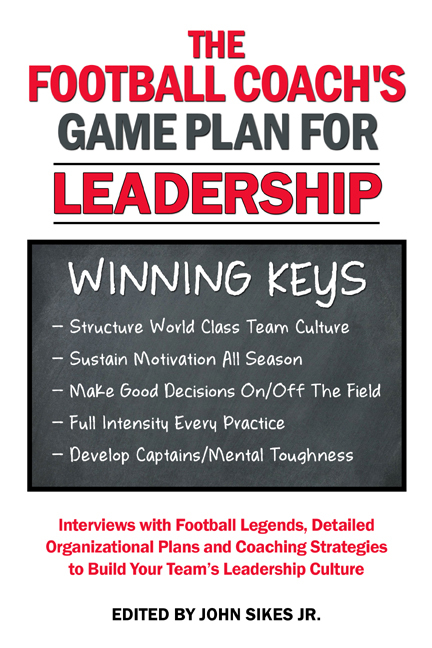 The 4 E’s of competition that have sustained one of America’s great high school football programs for decades…page 53. Mike Bellotti on team building integration of different cultures and backgrounds…page 71. 4 Steps Quarterbacks Can Take to Improve Performance when they don’t have their ‘A’ game…page 80. Systematic Approach to Taking One Play at a Time to Enhance Concentration and Mental Focus…pages 84-86. How Urban Meyer Uses “On Edge” Teaching to Keep His Players Mentally Sharp…page 95. Position Specific Visualizations that Build Confidence…pages 105-106. How Pete Carroll Uses Different Daily Emphasis During the Week to Get the Absolute Max from Each Practice…pages 109-110. 4 Common Team Captain Mistakes and 5 Key Responsibilities…page 145. How 3 NFL legends dominated the competition…page 147. Bill Walsh’s 10 Keys to Sustain Success…page 150. 3 Coaching Lessons from Bill Belichick…page 203.